"Beauty, following the sun's example, prevents us seeing what's around it whenever it appears." Whether you're carefully perusing the brittle pages of an old-fashioned whodunit or shooting over the fresh leaves of a neo-orthodox mystery, you are allowed one assumption if the sleuth hound happens to be nipping at the heels of a pernicious serial killer: the individual laboring fervently on the body count rarely does it to give sway to a twisted impulse, beaten into him as a child with a bible, or mere caprice. Serial killers that stalk the dark alleyways of this neighborhood of the detective story possess more refinement, cunning and are often as playful as a kitten with an attitude. A few well-known examples are Agatha Christie's The A.B.C. Murders (1936), Ellery Queen's A Cat of Many Tails (1949) and Soji Shimada's The Tokyo Zodiac Murders (1981). Paul Halter's The Seven Wonders of Crime (1997) follows a somewhat similar route as its predecessors, but this time the seemingly unstoppable sequence of murders are perpetrated by an individual who's artistically inclined – as well as mischievous and machiavellian. The elusive murderer, who seems to take pleasure in taunting and challenging the police with paintings that have cryptic hints plastered across their canvases, draws inspiration for a series of utterly bizarre and apparently impossible murders from the immense and architectural masterpieces of the ancient world: the Great Pyramid of Cheops, the Hanging Gardens of Babylon, the Statue of Zeus at Olympia, the Temple of Artemis at Ephesus, the Mausoleum of Maussollos at Halicarnassus, the Colossus of Rhodes and the Lighthouse of Alexandria. From this premise emerges a fascinating picture as each murder in the chain corresponds, one way or another, with one of the wonders erected by the erstwhile civilizations that used to inhabit this globe – and their appearance makes it tempting to ascribe these crimes to one of the deities that were worshipped during those earlier times. Naturally, these artistically inspired crimes eventually come into the peripheral vision of Owen Burns, an aesthete who considers murder to be one of the fine arts, and seems overwhelmed with the morbid creation of these felonious wonders. 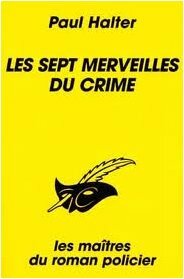 As his chronicler, Archilles Stock, notes, at one point in the book, is that his friend wallowed through this case as a shadow of his former self – completely blinded by the beauty that shrouded the truth behind these murders. Let's consider some of these gruesome, but wondrous, works of art, which began with the death of a lighthouse keeper on a cut-off islet during a severe thunderstorm as a scream bellowed over the waves to the mainland – which is connected to the islet but during a storm the path to the lighthouse is temporarily inaccessible. People saw the man turn into a human torch on the parapet, but they were unable to reach him until the storm has quieted down and when they finally reach the lighthouse they find that someone had locked the old man in. Another murders offers the problem of a man who was felled by a crossbow bolt that was dispatched from such a distance and angle that it could only have happened if the archer was soaring through the sky on the flying nimbus of Sun Wukong. I have picked out these two particular scenarios, because they are both original in their representation and inspired in their explanation – which made for a few new wrinkles in the pond of this beloved sub-genre of us. From the remaining five seemingly impossible murders two have a decent solution, two more are disappointing and one of them is simply preposterous. It involves a man who was uncovered in a house surrounded by un-trodden ground and the cause of death is dehydration, but there's a full carafe of water within arm reach of the deceased. I was expecting a solution as clever as the one Ronald Knox put forward to explain the starved man in his famous short story, "Solved by Inspection," but the answer is as psychologically impossible as the physical representation of the murder. But if you string together the seven murders that are, to all appearances, completely impossible, the ones with a stronger construction can easily carry the weaker ones and the section of the book where they are explained away, one after another, is the most satisfactory part of the story. However, if the seven impossible murders represent Halter's strength, coming up with baffling premises, which are, often enough, accompanied with clever explanations, than the characters and setting represent his weaknesses – which were also present in the previous novels I have read. There's still very little sense of time, place or characters, who seem to be unaware that they are people from the Edwardian period, which doesn't help, at all, in bringing that specific era alive like you should expect from someone who is seen as the modern-day heir of John Dickson Carr. Halter's idea of writing historical fiction seems to be throwing around a few allusions to the clattering of horses hooves in the opening chapters and hope that it will resonate with the reader until the closing parts of the book. It didn't. I also noticed that the worlds in which he situates his novels can be very claustrophobic. The Seven Wonders of Crime reputedly infuses the nation with dread and terror, as the citizens breathe a sigh of relief when they find out that the next name in the headlines isn't theirs, but the investigators focus their attention on a single household – which makes this amazing case feel like a surprisingly domestic affair. Contrast this with Queen's A Cat of Many Tails, in which the city of New York is turned into cowering and frightened character as the murderer bumps off one its citizens after another. Paul Halter remains a somewhat problematic writer, but one who has his heart in the right place and continues to exhume a part of the genre that others thought was buried forever. His only response to their horrified looks is a smug grin, that seems to suggest an unembarrassed pride at having just crammed over half a dozen impossible crimes between the covers of a single novel, which is a very infectious attitude that makes you want to overlook his flaws. 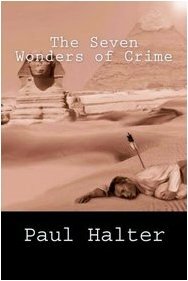 All in all, The Seven Wonders of Crime is an interesting, neo-orthodox detective novel that should have a spot on the shelves of every enthusiast of locked room mysteries and classically styled whodunits, but you have to take the good with the bad and accept the short comings that encircle the plot. The unbreakable chain of murders and their supernatural appearance are the main attraction of this novel with the actual murderer and clues a nudge or two below, however, they are not entirely without interest. Not perfect, but not bad either. Remember, if you purchase a copy of this book, whether it's digital or paper bound, you are giving John Pugmire are helping hand in bringing more of these stories to an international audience and show the publishing world that there are readers interested in this neo-orthodox movement – and this may open-up Asia for us somewhere in the future! Now that that's out of the way... I see we're in complete agreement about the death-by-dehydration, which I was particularly disappointed by because it was the most imaginative scenario out of them all! We also agree about the first and second murders being among the best. But good sir, where on your list is the sixth? That was another very good one! You're right to point out Halter's stylistic flaws, but as you you can tell from my own reviews, I tend to focus so much more on his *plots*. I find myself consistently fascinated with his imagination, to the point where 'm perfectly willing to forgive the shortcomings of the writing... as long as the solution makes it worthwhile! Still, when Halter does a decent job atmospherically (THE ONE-EYED TIGER and THE DEMON OF DARTMOOR are the best ones that have yet to be translated in this regard), the result is absolutely mind-blowing! THE ONE-EYED TIGER has one of my favourite locked-rooms of all time: a triply-locked room, guard and a trained elephant on patrol on the island, which is in the middle of a crocodile-infested lake... If it ever gets translated, I think you'd enjoy it. And as if by magic, my link disappeared from my comment. I'll try posting it again below. The sixth one was decent in its overall execution, but the first part of the trick, which consisted of reaching the pergola without leaving footprints in the surrounding soil, felt somewhat of a letdown and the easiest possible explanation. I read a few stories that used that part as a false, throwaway solution to explain the absence of footprints. The second part of the trick was good though. I feel that I'm slowly getting to the point where the flaws begin to have less sway on the opinion I have of him, but I still have that bug in my head that keeps me from completely enjoying his stories. I know I have said this before, more than once, but all those comments praising Halter as the second coming of Carr and Chesterton has done him no favors. It would've been better (and far more honest) if he was hailed as someone who continues a fine old tradition and does a fairly good job at it, because he simply does not live up to the (sometimes god-like) praise I have read over the years. I'm also of the opinion that Halter is at his best with the short story format. Talking about opening up Asia in the near future, I would love that to happen. Living in India, it is so difficult to find GAD books unless you chance upon used ones. I am a great admirer of John Dickson Carr, which is why I have been reading Paul Halter. Luckily, there is an online store in India which stocks his books. Having read your review of the new English Halter title, I have bought it 5 minutes ago. Can't wait to read it. Thanks for the heads-up! Welcome to the niche corner, dedicated to the great detective stories of yore and their neo-classical descendants. "The fine detective story, be it repeated, does not consist of a clue. It is a ladder of clues, a pattern of evidence, joined together with such cunning that even the experienced reader may be deceived: until, in the blaze of the surprise ending, he suddenly sees the whole design." "Gold comes in many forms. For literal-minded people gold may be merely a precious metal, physically stripped from the earth. For fans of Golden Age detective fiction, however, gold can be artfully spun out of the human brain, in the form not of bricks but books."